My bedroom is at the point where it is depressing me, I hate the decor and want to really transform our bed and decoration. I'm not really sure what possessed me to put bright pink flowers on a dark background on my walls and it is a decision I regretted almost straightaway. Our bedroom is only small and appears to make it so much smaller. This is one of the jobs on my hubbies 'To Do' list and hopefully he will be completing this over the coming weeks. I have been lucky to team up with Yorkshire Linen to improve our sleeping area and would love to know what you think of my choices. 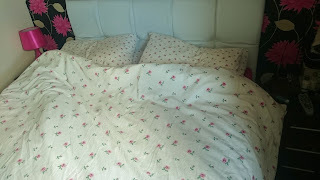 Below is my old bedding which is looking weathered and shabby and not at all enticing after a hard day at work. This is a moodboard of bedding that I would like to go with my neutral decor once it is completed. 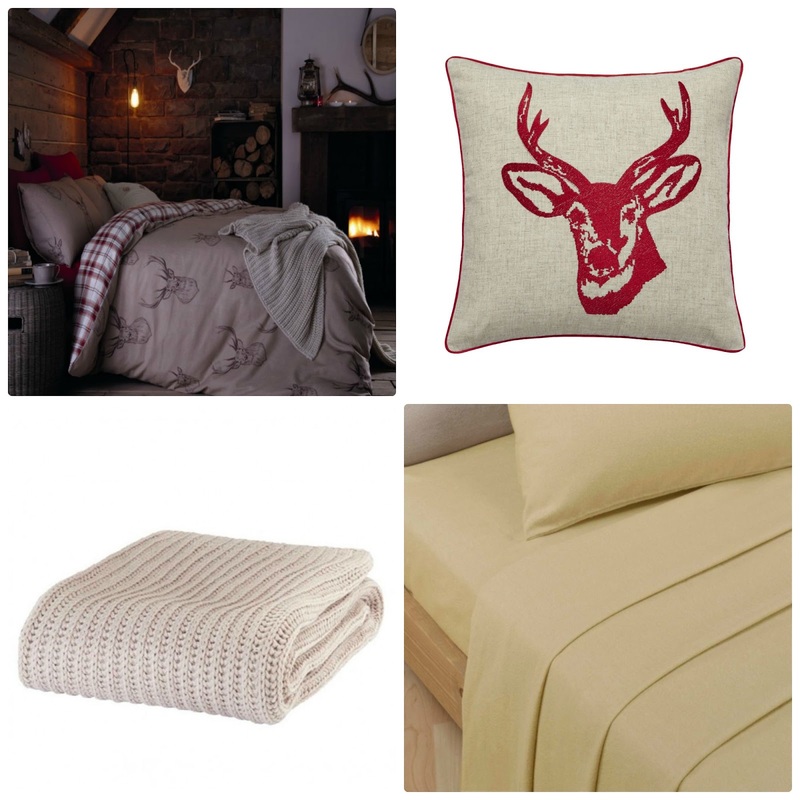 I adore this Stag bedding and priced at £19.99 for the kingsize its definitely a bargain, this would transform my bedroom in to a proper countryside haven and a welcome place to enjoy a good nights sleep. Yorkshire Linen have lots of lovely duvet covers to choose from here. You just need to have an extra cushion on your bed for aesthetic purposes and the Red Stag cushion priced at £5.99 would look wonderful, especially given the stags and tartan on the duvet cover. There are so many cushions I was spoilt for choice. Egyptian Cotton Sheets are a must and although more expensive than manmade fabrics I just love the luxurious feel against my skin. With so many Sheets and Pillowcases to choose from I finally settle on the biscuit colour of the Belledorm Egyptian Cotton kingsize fitted sheet would look great under the Stag duvet cover and costs £29.99. Finally I picked a natural Knitted Throw from the Bedspreads and Throws as I wanted something warm and cosy for those nights when it starts to get chilly and I just adore the chunky texture of the one I have chosen, priced at £16.99 I think it is quite a bargain. So what do you think of my choices? I would love to know. Competition Entry for Yorkshire Linen. I love knitted throws they look so cosy, love the bedding you have. These products are awesome. My personal favorite is decorative cushion.